This layout is built on an old pasting table, the overall size being 1 square metre, and the design was originally intended for a competition to build a layout with a maximum size of 1 square metre.1/12th scale is more associated with dolls houses, but is starting to be used by some railway modellers. The track gauge corresponds to either 50cm or 60cm, both common gauges in France. Many of the items on layout are from dolls house suppliers, but the back scenes are my own artwork. Track is standard G gauge track from the German manufacturer LGB., as is the rolling stock, suitably modified. 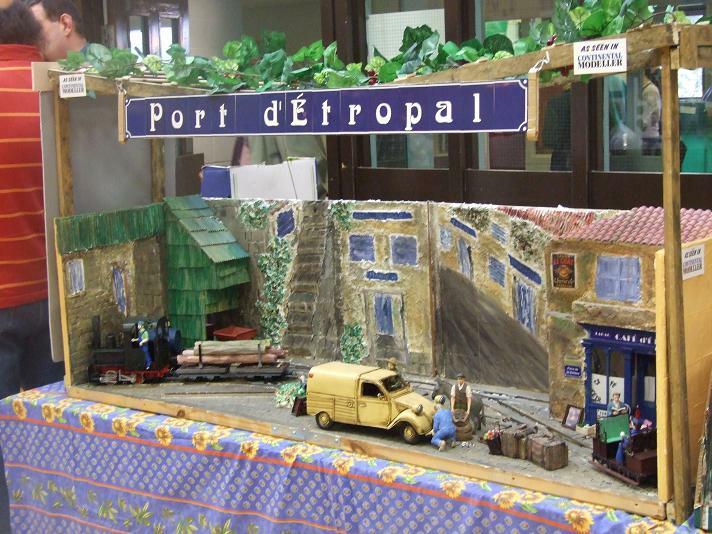 Port d’Étropal is a small inland port somewhere in France, where gravel is loaded into railway wagons from boats(not seen on layout). The full wagons are shunted around the layout so they can be unloaded in the fiddle-yard area, and then the shunting operation is reversed so the wagons can be refilled under the hopper. On other occasions other trains make an appearance. To the right hand side of the layout the fiddle yard has been extended to make unloading easier, as well as allowing an automatic shuttle to be run. Other items of 1/12th buildings and stock are also on show in this area.